Rowe Sprinkler Systems continues to demonstrate dynamic and consistent growth. We are interested in hiring the best and the brightest employees! Once you are part of The Rowe Team, you will receive on the job training, supervision, and the opportunity to participate in programs to earn industry NICET certification. Rowe also maintains an Apprenticeship Program – a Department of Labor initiative which enables our company to continually develop top performers in the industry. Apprenticeship gives employees the information to understand fully how design and operation apply to the hands-on work being completed at your facility and also classroom instruction. Apprentices work under a journeyman (someone that has completed the actual program and is registered with the DOL) and are on a set pay scale with incremental raises associated with completion of set training modules. Project designers for the Fire Protection Industry are needed. Individuals should at a minimum have CAD experience, preferably AutoCAD. Experience in the construction industry is a plus as well as stock listing, calculations and project management. Individuals will be required to obtain and maintain NICET certification. Valid driver’s license, attention to detail and willingness to learn is a must. Compensation is commensurate with experience. Project leaders with hands on mechanical aptitude are needed. Individuals should have residential or commercial construction experience in either plumbing or mechanical trades. Candidates must be able to read blueprints, climb ladders, use lifts, operate power tools, use hand tools, and read tape measures. Project Leaders/Foremen must be willing to travel to jobs within PA and some adjoining states. Overtime is required as needed. Project leaders must be capable of planning work efficiently for team of 2-5 employees and working with them to meet weekly goals. Candidates must be able to work independently, solve problems, exhibit good work ethic and assume responsibility for team job specific tasks. Valid PA driver’s license, accuracy, punctuality, and motivation to learn are required. Pipe fitting and fire sprinkler experience is a plus. Pay rate based on experience. Benefits are available including travel compensation when applicable. 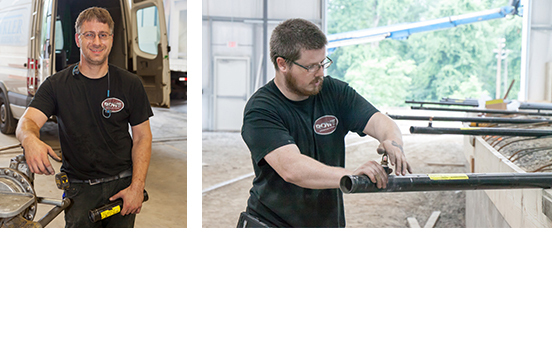 Installers with mechanical aptitude are needed. Individuals should have the ability to climb ladders, use lifts, operate power tools, use hand tools, and read tape measures. Staff must be willing to travel to jobs within PA and some adjoining states. Overtime is required as needed. Candidates must exhibit good work ethic and assume responsibility for assigned tasks. Valid PA driver’s license, accuracy, punctuality, and motivation to learn is expected. Pipe fitting and fire sprinkler experience is a plus. Pay rate based on experience. Benefits are available including travel compensation when applicable. Service and Inspection Technicians for the Fire Protection Industry are needed. Knowledge of fire protection systems including wet and dry sprinkler systems or demonstrable equivalent experience with hydraulic systems is required. Individuals should have excellent trouble shooting skills. Candidates must be able to read blueprints, climb ladders, operate power tools, use hand tools, and read tape measures. Techs must be willing to travel to jobs within PA and some adjoining states. Position requires overtime as needed and schedule must be adaptable. Candidates must be able to work independently, solve problems, exhibit good work ethic and assume responsibility for safety equipment being tested or serviced. Communication skills and interaction with customers are a must for this position. Valid PA driver’s license is required. On the job training is available for qualified candidates. Accuracy, punctuality, and motivation to learn are critical. Compensation is commensurate with experience. Note that information submitted via our website is only considered an expression of interest. To be considered for employment, interested parties must apply in person.